A posing stool named for a photographer who liked it so much. Comfortable 2" urethane cushioned steel seat. Strong high impact nylon base for stability. Box Dimensions (LxWxH) 22.5 x 20.5 x 9.5"
Monte Zucker Pneumatic Posing Stool is rated 4.7 out of 5 by 31. Rated 5 out of 5 by Jeff from Pennsauken from Definitely a Good Buy! Why this stool? The seat and the way it's constructed. Solid firm rubber like material. Comfortable enough to get the client to sit and get the shot. I've read a reviews of cheaper stools with the cushion type vinyl (I'm guessing vinyl) covering where the vinyl starts to rip, tear, crack or get punctured by any object. Why spend the $60-$70 just to maybe have to repair, upgrade and get this stool. Also the slinky like cover helps to keep the chrome metal from disrupting from the all black murdered out look. Rated 3 out of 5 by Mike from Great stool but it spins! Great stool however there is no way to make it stop spinning. How is a spinning posing stool helpful? I shoot small kids and if their feet can't touch the floor, they can easily move and can stop spinning. Quality of the build is amazing, however I have to return this and find one that doesn't spin. Rated 5 out of 5 by Anonymous from It does what is suppose to. It is very easy to put together. It blends into the background when photographing subject. Confortable. Easy to use. It is a 1,000 times better than that generic piece of junk that an un named photo store that has locations across the country; tries to sell you where the pieces don't even fit together, or they foget to give you all the pieces. Rated 4 out of 5 by Anonymous from Nice addition to my studio The posing stool is a perfect addition to my studio equipment. I usually shoot on location and it fits nicely into my back seat of my car. I just wish that it was designed for travel as it is somewhat cumbersome. Other than that, it is really a nice stool for my clients and sure beats using a wooden stool that doesn't adjust quickly. Rated 4 out of 5 by Nikonnex from Great stool -- no assembly instructions If your goal is to take a photo of an attractive piece of furniture with a person happening to sit on it, this is not your stool. However, if you are taking photos of a model and want a sturdy, adjustable and reasonably priced stool for them to sit on that will not draw attention to itself, this is the stool to get. 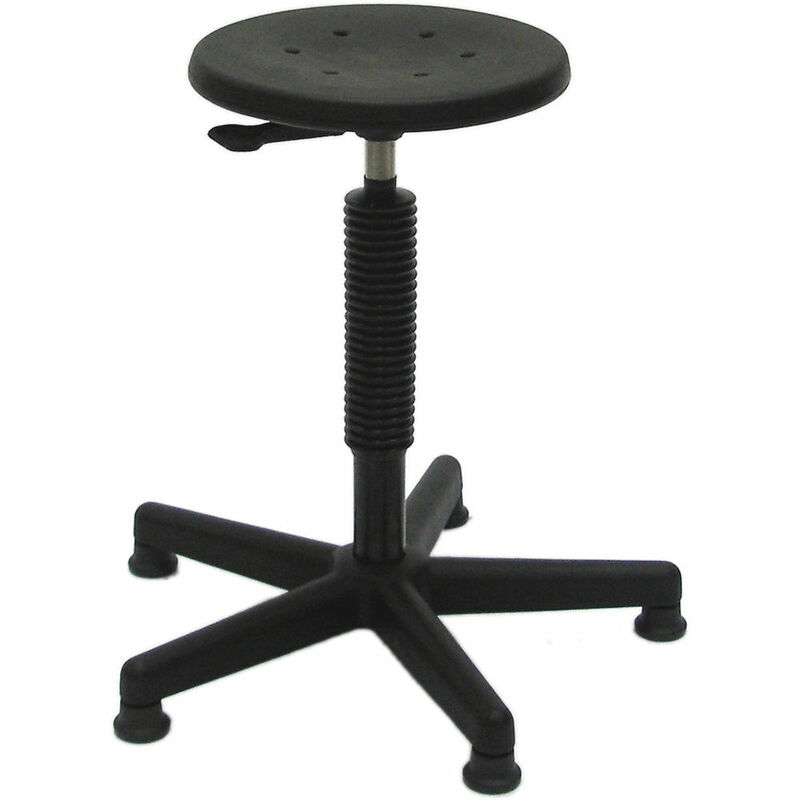 Once put together, the height is easily adjusted on this stool with a pneumatic tube controlled by a paddle lever (push lever to raise, sit on stool and push lever to lower) and the adjusted height securely stays put when the paddle lever is not engaged. The stool is relatively comfortable to sit on and should be durable with its molded plastic seat rather than a fabric or fake leather cushioned seat. I appreciate the wide stance of the five leg base, which makes the stool virtually impossible to tip over, unlike 3 or 4 legged stools. Although very robustly built and a breeze to use when fully assembled, mine came with absolutely no instructions for assembly or use other than a small label saying Remove this on a plastic cap at one end of the pneumatic tube assembly. (One star deduction for this.) Fortunately, about ten minutes of tinkering succeeded in getting it put together, and in its completed state it is solid and sturdy. With its matte black finish, the stool will likely not be the center of attention in photographs. A black collapsing plastic tube is included to cover the polished chrome portion of the pneumatic tube assembly. I like having an adjustable stool rather than a fixed-height stool to be able to easily accommodate various heights of models and to allow a quick change of pose while continuing to provide support. Rated 5 out of 5 by Anonymous from The BEST Posing Stools on the Planet These stools are built very well. Easy to work with. Non maring feet. Can be stacked to use as a Posing Table. Great height range. Very stable. We use and abuse them daily. They should last for years.